This topic is to give an overview of what ISO 15926 is and what it can bring to your company. This is about how to get control of your share of the information that is produced and used in the process industries and its many players, often in many countries around the globe. interfacing, that is very costly and maintenance-prone. Managing that reliable information reaches the users of that information when they need it is still a matter of "hard labor", costly and inefficient. Integrating all that information, so that you have an audit trail, is impossible or only possible for a limited data set (typical for Big Data). 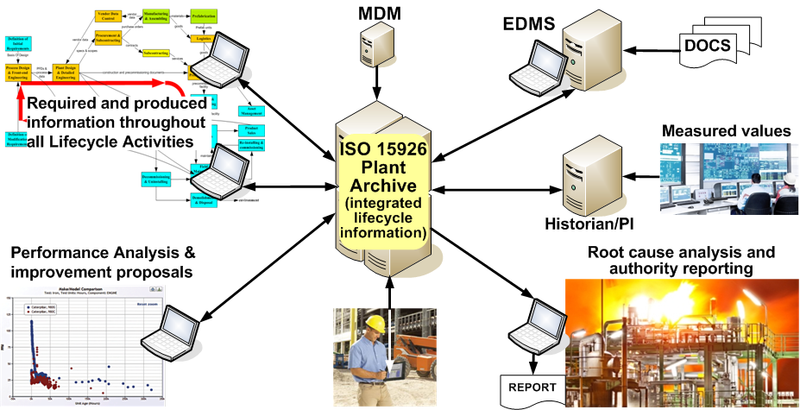 Lifecycle information integration, supported by ISO 15926, covers all the above. NOTE 1 - The above colored blocks are called Lifecycle Activities. 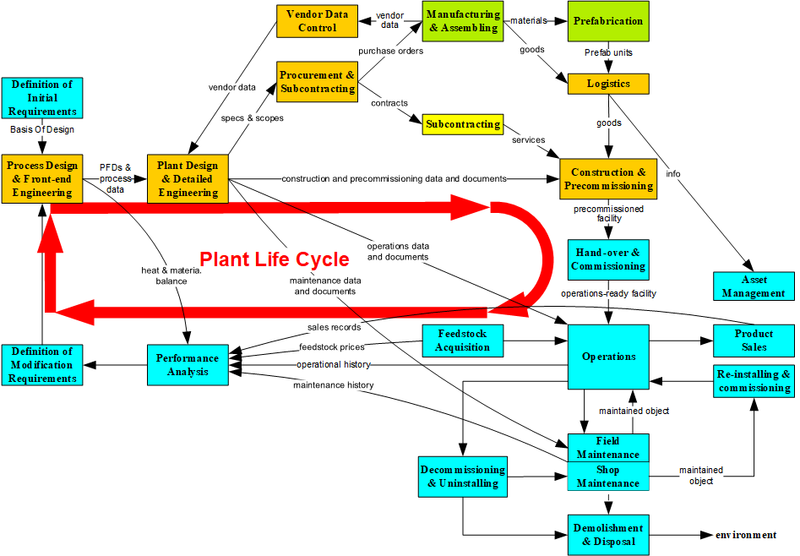 Each information is explicitely related to the Lifecycle Activity in which it has been generated. Of course it can be consulted from another Lifecycle Activity. NOTE 2 - The life cycle is circular, not a linear path from "cradle to grave". For any anticipated change the full circular lifecycle path must be followed, although that isn't the paradigm of most practitioners. Not adhering to the checks and balances of that lifecycle path may, in the long run, result in a suboptimal design and sometimes dangerous situations. Make sure that each and every software application gets an ISO 15926 adapter that can export its generated information in the ISO 15926 format and can import data, generated by others, for its internal reference. That doesn't come free but is worth the effort. It is like learning one of the world languages, like English, so that you can communicate with others who master the same language. But unlike the situation with natural languages, in this case there is only one: ISO 15926, no matter what IT gurus (often with commercial ties) may tell you. By no means! These are as useful as always. ISO 15926 is not intended to replace any system. It is exclusively intended for data management, providing a neutral layer of information in an ISO-standard format to which your systems can upload information to and download information from. Application-to-application exchange, a use of ISO 15926 that we do not advocate because of lack of real data management. All "cradle-to-grave" information can be integrated. It is known when particular information became valid and when it became no longer valid. That means that whatever "cradle-to-grave" information you want to store, it can be retrieved in any required detail and combination. It is possible to replay history, similar to an airplane's "Black Box". That is what is called "Big Data", but it covers a much larger variety in information than typical Big Data implementations. That history replay can range from a question what, years ago, the design criteria were (for example in the case of a revamp or replacement), combined with the maintenance history, to a full-fledged statistical analysis of the cause of some operations problem or maintenance problem, and to all information that is required for a root cause analysis in case of an accident, as required by the authorities. You can integrate documents, stored in a commercially available, professional, EDMS (Electronic Document Management System), into the integrated lifecycle information. There is no fixed data model, any information type can be added later, on the fly. It is possible, though, to build modules for re-use. When you consider yourself as a visionary manager: start a small Proof of Concept project and get in touch for help (no strings attached). For a presentation with a little more (not much) technical detailing click here. (NOTE - it may take some time to start the (short) presentation).